Strange but true: I don’t like chicken noodle soup. It bores me or something like that. Don’t get me wrong, if I am sick, I would not turn away a friend who brought me some to help cure my illness, but other than that, no thank you. Interestingly enough, Anthony’s favorite soup? Chicken Noodle. Go figure! 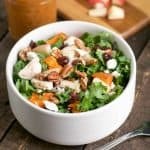 However, I have always been a fan of a good chicken and wild rice soup, but it has to be really hearty, and not too brothy–picky? That’s me I guess! But today, I bring you just that! So I am not a huge fan of cream based soups. I typically like a really chunky soup, but broth based. My personal favorite soup of all time is my Chunky Italian Vegetable Soup. That is on high rotation during cold weather around here. We also love this Black Bean + Rice Soup for when we want something close to chili but not quite. 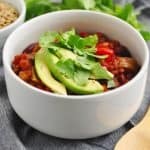 There’s plenty of other options over in my Soup and Chili Recipes Page, but you will notice, not a ton on the creamy side there. If I do have a creamy soup it’s still more like a butternut squash soup or something of that sort. 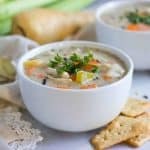 However, a thick and creamy chicken and rice soup is my kind of chicken soup for the soul. There is so much lately on the instant pot and it makes sense with our fast paced way of life, but there’s nothing, and I mean nothing like my slow cooker. I use the heck out of that thing all year. I am sure at some point I will give the instant pot a try, but for now, I am happy with my crock pot. There is just something about food that is slow cooked. 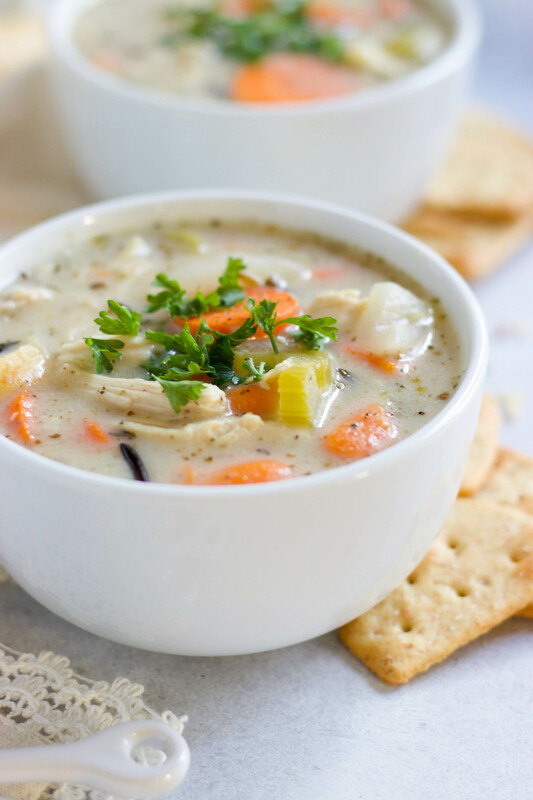 If you are a fan of thick, chunky soups, then you are going to love this one! I used Italian seasoning because mine included a lot of the spices that I love in a chicken soup: sage, rosemary, oregano, etc. Then I tossed in a bit of thyme and it really rounded things out. Every Italian seasoning is a little different, but I am pretty sure whatever kind you have will still make the flavor savory and delicious. For me, Italian Seasoning is a lot like the Mike’s Red hot commercial says, “I put that (bleep) on everything!” Ha. 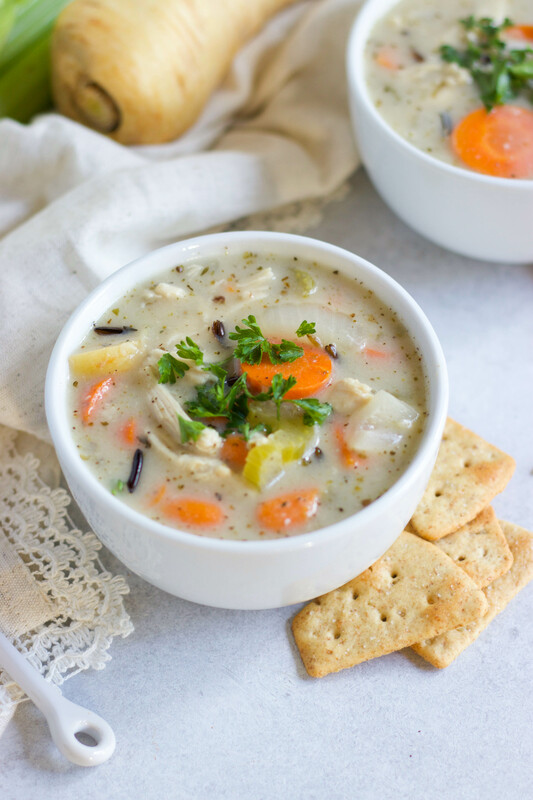 I also added some parsnips to this soup to switch up the typical carrot and celery mix–there is still celery and carrot but the parsnip in addition! Another reason I am super excited about this soup is that I am working on a sourdough starter so I can start making my own bread. And I am very certain that freshly baked sourdough will be the perfect pairing for this soup, so all the more reason to make it again and soon! Should be all set by the weekend to make my first loaf so I will keep you posted on how it goes. We are heading into a weekend with a cold front and snow in the forecast so that can only mean one thing: soup time! Dice onion, chop carrots, celery and parsnips and mince garlic. Lay chicken at the bottom of the slow cooker and then top with garlic, Italian seasoning, thyme, parsley and sea salt and pepper. Add onion, carrots, celery and parsnip on top. Add broth, uncooked rice and bay leaf and cover. Once chicken is cooked through, remove and shred and then add back into the soup. About 30 minutes before serving, melt butter in a sauce pan and add flour and whisk together. Slowly add in milk and cream and whisk until it thickens. Remove from heat and then add about a cup or two of soup to the sauce pan and whisk to combine. Pour mixture back into slow cooker and stir. If soup is too thick for your liking, add more broth. Serve with your favorite soup toppings. We loved fresh parsley chopped on top! This soup looks so creamy and delicious! Perfect comfort food for a cold night! Yep! Bring on the snow! I’m making this for the 3rd time now ! This is so easy to make and tastes phenomenal! I use Lundberg’s Wild Rice in it. Gluten free , non- GMO verified, vegan, whole grains. Obviously a winner for cold evenings! Thanks for the recipe! Larry!!! Thanks so much for sharing. Loving your feedback, totally making my day! I have totally not bought into the whole Insta Pot phase! I LOVE my slow cooker and feel like nothing could ever beat or replace it! Plus who needs another kitchen gadget to store right?! 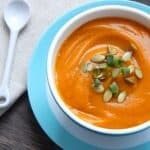 This soup is definitely something my entire family would love! Yep. I have no idea where I’d put an insta pot! This is a soup that I’ve wanted to make for ages, and your version looks as pretty as any that I’ve seen! Looks so filling! My husband would love this! I’m the same way as you about soups! Since going vegetarian a few years ago, I’ve leaned more towards these kinds of soups (chunky but broth-based), and I think chickpeas could be a good substitute here. Thank you Lorie! Chickpeas for sure! I also thought about doing cannelloni beans! And yea, the chunkier the better!!! Thanks Sarah! A comfort food classic perfect for chilly winter days! Slow cooker makes it perfect for enjoying after a day playing outside. Slow cooker always for the win. This looks BEYOND good! With the weather cooling down this is the perfect creamy soup for a cozy night in! Great post! Hi! Do you think you could substitute almond flour instead of flour and almond milk instead of whole milk? We don’t normally eat dairy or gluten. This sounds delicious. Thanks! Hi Jennie! I would try an all purpose gluten free flour. That should work just fine. And the almond milk should be fine as well! I love letting my slow cooker do all the work! I get a great smelling house and dinner at the same time! The aroma is always the coziest! Thanks so much for making the recipe available for all! It loos like good one. However, you might want to adjust the prep time. By the time you get everything out, measured, cleaned, sliced,etc. It’s about 30 minutes prep. Also, there isn’t anything in the instructions WHEN to put the rice into the cooker. This is my first time using this recipe, so I’m just going to put it in from the beginning and see how it comes out. I’m using a Crock Pot (brand) slow cooker. Oops! Thanks for letting me know about the rice, Larry! I totally missed that but you were right to put it in the beginning. I will adjust the prep time as well a bit, too. Thanks for the feedback and I hope it worked out!